VanKam Truck Caps started out in 1966 renting RV's in Muskegon, Michigan. By the early 1970's VanKam Truck Caps was manufacturing their own commercial aluminum truck toppers and cargo trailers. The company began distributing fiberglass truck toppers in 1979 and today is a dealer for Leer Fiberglass Truck Caps. Van Kam doesn't have any distributors or resellers but welcomes any and all interested parties to visit them in Muskegon and build your own customized commercial aluminum truck topper together. While most of you don't have the luxury of travelling to Michigan to build and buy your truck cap, this company is a great example of excellent quality work done by smaller, regional truck cap manufacturers. These guys probably have a welder that has been on the job longer than most truck cap manufacturers have been in business! And any of you in the Muskegon Michigan area should give these folks your first look and greatest consideration. 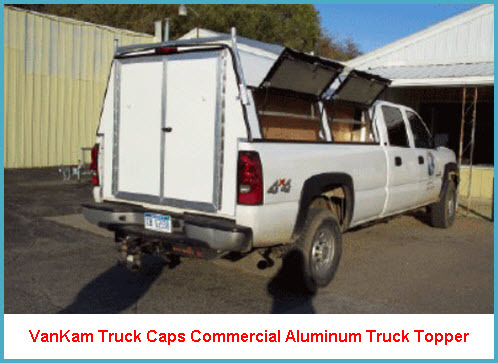 Here's some of the features you can expect to see in a Van Kam aluminum truck cap.